Dance Commentary by Heather Desaulniers: "Coppélia"
For the second full-length narrative in San Francisco Ballet’s 2016 season, Artistic Director Helgi Tomasson chose George Balanchine and Alexandra Danilova’s Coppélia, first performed by New York City Ballet in 1974 and entering SFB’s repertory in 2011. A lovely contrast to the intense drama of last month’s Swan Lake (and what awaits in Onegin later this spring), Coppélia is charming, funny and whimsical. At least on the surface. Look beneath and you will see that while light-hearted, the ballet is not at all one-dimensional. There is mischief. There is mystery. There is manipulation. And each of these varied narrative fibers is needed in order for the story to reach its joyful conclusion. Four main characters collide in this fanciful tale of love, flirtation, wandering eyes and mistaken identity - young couple Swanilda (Frances Chung) and Franz (Vitor Luiz), the curious old villager Dr. Coppelius (Pascal Molat) and Coppélia, a life-size doll built by Coppelius, whose existence hovers between reality and make believe. 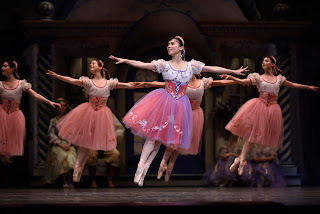 In Swanilda’s introductory solo, she is trying to connect with Coppélia, whom she does not yet know is only a doll. A delightful invitation to friendship, this dance is filled with sweet boureés and delicate cabrioles. But to her dismay, Coppélia does not engage with her. As Franz enters the scene and begins his first pantomime sequence, the viewer quickly learns that he is keeping his romantic options open; smitten with Swanilda but also enchanted with Coppélia. And he is unaware that Swanilda has hidden and witnessed his flirtatious ways. As we follow the rollercoaster of Franz and Swanilda’s relationship, a number of gorgeous group sequences unfold. A predictor of love, the slow, lithe ‘wheat dance’ impressed with its elasticity. Variations by Swanilda’s eight friends were positively effervescent. Luiz soared through Franz’s solo (which has some finicky direction changes and demi-second transitions) with his gravity-defying leaps. And Chung demonstrated through the entire Act that she is the utmost technician, an incomparable artist and a master of character portrayal – the ultimate trifecta. Her series of brisés, jeté entralace and Russian pas de chat sang through the space. Act II is where the magic happens, literally and figuratively, as Swanilda and her friends venture into Dr. Coppelius’ home, having found the key in the street. They uncover the secrets and truths that lie within, including the fact that Coppélia is indeed, a doll. Coppelius returns home and chases them out, except for Swanilda who has hidden. Then Franz arrives on the scene, in the hopes of glimpsing Coppélia. In the moment, Coppelius has the idea that he can transfer Franz’s life spirit to Coppélia and make her real. To that end, he begins plying Franz with wine. Molat and Luiz’s mime was so detailed, exact and precise that even if you were unfamiliar with the synopsis, it was completely clear what was going on. Coppelius is often touted as the mysterious orchestrator of events in this ballet, but as Act II continues, it is clear that Swanilda is in fact, the one in control. By disguising herself as Coppélia and tricking him into thinking that his plan has worked, she is able to save Franz. And here we see the strong and smart Swanilda - the capable and clever, the innovative and ingenious. In outwitting Coppelius, she emerges as the ballet’s triumphant champion. Once he wakes, Franz and Swanilda are reunited, he apologizes and they quickly exit Coppelius’ home, leaving him alone. This scene was brilliantly played by all involved, though the convincing of Coppelius that his doll was real went on longer than necessary. He had bought in to Swanilda’s ruse, one hundred percent. It could have been much shorter. If Act I and Act II were all about the narrative, Act III was certainly all about the dancing. And in true ‘Act III style’, a collection of divertissements are offered, followed by a grand pas de deux by the lead couple. Students from the San Francisco Ballet School played an exciting role in these vignettes, creating a ‘living’ frame for each of the dances. They are to be commended for their outstanding presence and technical ability! Lauren Strongin led the ‘Waltz of the Golden Hours’ with a flawless sequence of intricate pointework. Sasha De Sola’s incredible suspension was perfect for the ‘Dawn’ variation, appropriately rising in concert with that time of day. Sofiane Sylve’s reflective take on ‘Prayer’ extended outward and upward, ending with a beautiful relevé long into penchée arabesque. The ‘Jesterettes’ danced wonderfully from their opening pose to the entrechat quatre series. But there was a tendency from some to pull focus, which broke the cohesiveness of the quartet, which after all, is still a group dance. And the ‘Discord and War’ section baffles. It was handily performed by the entire cast, but choreographically, seems like it has been dropped into the ballet with little context or relation. But that disconnect was easily forgotten as Chung and Luiz took the stage in the grand pas de deux, titled ‘Peace’. Regality and elegance abounded in their partnering, their solo work and the final coda. Luiz’s batterie stunned with accuracy and height. Chung’s attitude turns were phenomenal, changing mid-rotation from front attitude into back. It was an amazing conclusion to a truly glorious night of uplifting classical ballet.